UNIST to develop ways to predict severe heat waves days or weeks before they happen. 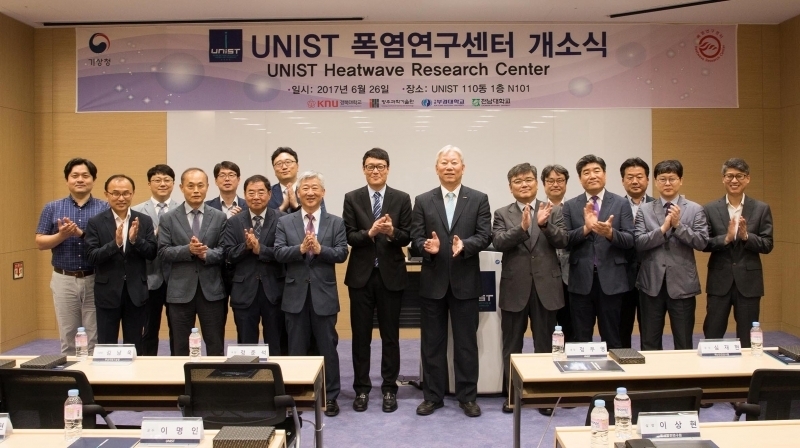 On June 23, UNIST held a ceremony to mark the official launch of the UNIST Heatwave Research Center. With the help of this center, UNIST will develop new prediction technologies that can provide a warning for a heat wave up to two weeks in advance. Heat or hot weather that lasts for several days, often referred to as “heatwaves” is a serious public health hazard in several places around the world. Heatwave warnings are issued in South Korea when temperatures are expected to reach at least 35 degrees Celsius, or 95 degrees Fahrenheit, for two consecutive days. With current models, heat waves can only be predicted reliably on a short-term basis, providing just a few days of notice before they occur. The existing long-term weather probability tools do not help for heat waves, as they do not include temperature extremes in their overall weather trends. The ability to predict heat waves in advance would be extremely useful for farmers, city officials and emergency planners who must deal with heat-associated crop losses, increased energy requirements and heat-related illness, according to Professor Myong-In Lee of Urban and Environmental Engineering. Funded by the Korea Meteorological Administration (KMA), the center will develop heatwave forecasting technologies and train weather experts. The center will provide funds of four-point-five billion won to the institute over nine years.